I recently attended a careers fair at Heriot-Watt university, and was pleased to find that amongst all the usual junk produced en masse and handed out to students who don’t really care in the hope of grabbing their attention (pens, keyrings, bottle openers, leaflets, free sweets, money…), I found something which actually caught my interest – a simple wooden puzzle, where you have to assemble 7 tetris-like blocks to make a small cube. 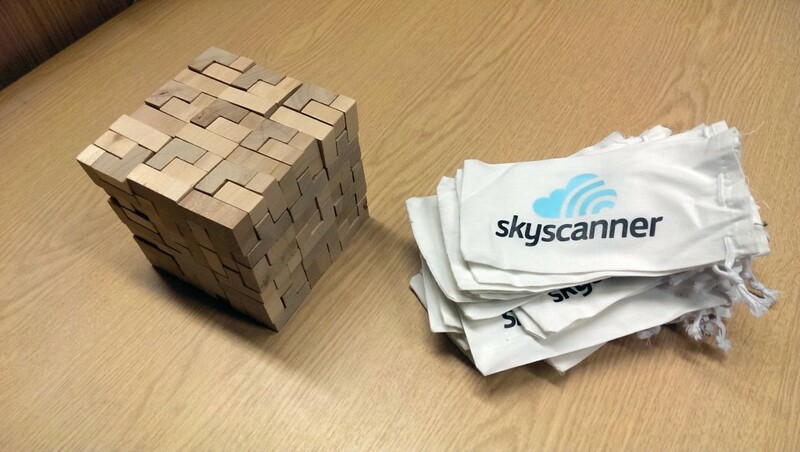 The company handing these little branded puzzles out was Skyscanner, a rapidly expanding, now multinational tech company based in Edinburgh. Little details like this are the kind of thing which make me want to apply to one company over another for a job; if there are innovative minds in there coming up with things like this and being allowed to run with them, chances are the company ethos is going to be open-minded enough to fit in with my way of working. Anyway, I had the urge to take the puzzle a step further, and asked the woman running the booth if I could have 27 of these freebies to make a larger cube, and make a stop-motion video of the creation process. This was my entertainment for the whole afternoon!